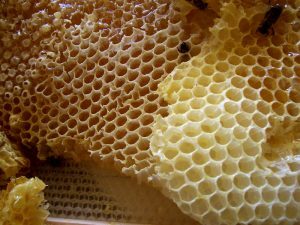 Wax history: Bees make honeycomb out of wax to keep their honey in. Why do bees make wax? Honeybees make wax as part of their normal lives. They build the wax out of fats, and they build it into honeycombs. They use the honeycomb to store their honey, and also to raise their babies in. When did people start to use wax? People have probably been using beeswax for as long as they have been collecting honey from beehives, which is as long as there have been people alive. In the ancient world, where there was no plastic or any other kind of petroleum or rubber, people used beeswax for all kinds of things. Ancient doctors also used beeswax in medicine – to fill cavities in teeth. Get your own beeswax candles! They smell great. Artists mixed beeswax with colors to make paint, and they painted with this wax on wooden tablets. Sculptors used wax to make bronze sculptures. Coating wooden tablets with wax also made a very common writing surface for temporary records, much cheaper than papyrus or parchment. People also used wax to seal letters and baskets closed, so they would know if anyone had opened them. In the Middle Ages, when more people lived further north, they found olive oil was too expensive to use for light. Olive trees didn’t grow well in northern Europe. So people started to use beeswax to make candles for light. Cite this page: Carr, K.E. What is wax? Bees and beeswax. Quatr.us Study Guides, September 8, 2017. Web. April 25, 2019.